CARESCAPE™ R860 features expert user tools, an innovative user interface, and is inherently familiar the first time you use it. Featuring expert user tools and an innovative user interface, the CARESCAPE R860 is inherently familiar the first time you use it. Navigating past, present and future states of your ventilated patients is the foundation of the CARESCAPE R860 user interface. From the center workspace view that highlights current patient status, you can swipe left to right to navigate from historical trends on the left (past) to Clinical Decision Support tools on the right (future). Your settings are recalled even as you navigate across workspaces. By replacing menus with workspace views, the CARESCAPE R860 has flattened the learning curve and unlocked ventilation capabilities by making them more accessible and easier to use. The user interface on the CARESCAPE R860 represents a leap forward in our touchscreen technology. Intuitively organized and easily accessible, relevant clinical content and therapy controls are not buried in menus, they are at your fingertips. Keep your focus where needed. Interactive touchscreen slider controls of the master timeline in trend views reveal event-centric historical data that lets you take a snapshot into the past. This allows for a deep dive to compare settings, measured values and alarms within a specific period of time. We&apos;ve also made alarm management easier to manage by centralizing alarm functions and making patient alarm history easy to find with a single touch. Through useful data to support clinical decisions and convenient workspaces that can be customized for each patient, you can confidently provide tailored therapy with a touch of brilliance. Customizable settings and predictive protocols help clinicians assess and address appropriate respiratory therapy. Using the advanced tools in the CARESCAPE R860, you can tailor care to meet the patient's requirements. A vigilant focus on lung protection. The Lung Protection tools in the CARESCAPE R860 calculate FRC, providing you with data for determining the optimal PEEP setting for the patient. The CARESCAPE R860 offers advanced tools for Indirect Calorimetry measurements that are measured, not estimated. 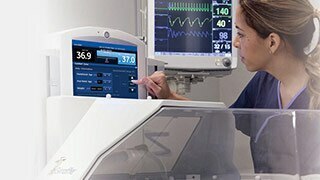 The Metabolics feature in the CARESCAPE R860 has the potential to support improved patient outcomes, reduce infection rates and shorten the length of stay in the ICU.† The GE gas module measures inhaled and exhaled gases which the physician can use to assess a patient's nutritional status. † Neumayer LA, Smout RJ, Horn HG, Horn SD. Early and sufficient feeding reduces length of stay and charges in surgical patients. J Surg Res. 2001;95(1):73-77. | Dasta J, McLaughlin T, Mody S, et al. Daily cost of an intensive care unit day: the contribution of mechanical ventilation.Crit Care Med 2005 Vol. 33, No. 6, pgs 1266-71. | Rubinson L, Diette GB, Song X, Brower RG, Krishan JA. Low caloric intake is associated with nosocomial bloodstream infections in patients in the medical intensive care unit. Crit Care Med 2004; 32(2): 350-356. †† Bronagh Blackwood, Fiona Alderdice, Karen Burns, Chris Cardwell, Gavin Lavery, Peter O'Halloran "Use of weaning protocols for reducing duration of mechanical ventilation in critically ill adult patients: Cochrane systematic review and meta-analysis. ", BMJ, vol. 342, 2011. The CARESCAPE R860 was designed with a simple and universal navigation scheme. The Lung Protection tools calculate FRC, providing the clinician with data for determining the optimal PEEP setting for the patient. The ventilation requirements for neonates are very different from the needs of adults. That’s why it’s important to have a Neonatal option designed to meet the specific physiological needs of the neonate. With the CARESCAPE R860, validated to treat these vulnerable patients, special color-coding distinguishes this NICU option from other ventilators in your fleet. And specialized ventilation modes are included that help transition neonatal patients off of mechanical ventilation. Modes like Volume Support help support spontaneous breathing. The mode nCPAP, with the option of setting Rate and Pressure, can help support the baby non-invasively and prevent intubation. Split screen view supports four Spirometry views, as well as the ability to select up to four waveforms and seven measured views. By precisely tailoring ventilation to serve the sensitive needs of neonates, you can expand your diagnostic therapy capability. GE Healthcare offers a comprehensive line of patient monitors for virtually every care setting with smart features that are in step with your needs – clinical accuracy, streamlined workflow, improved patient care, and cost efficient. GE monitors connect you to precise, relevant clinical data—when and where you need it—while making the most of your existing equipment investments.